Some links to various favorite recipes, to start here’s a few pix and links. 1. In a sauté pan over medium-high heat, add olive oil and shrimp. 2. Cook shrimp for 2 to 4 minutes per side until they turn orange/red in colour and opaque. Add chili garlic paste and stir to coat, continuing to cook for 30 seconds. Remove from heat and set aside for later use. 3. In a medium-sized bowl, combine cilantro, avocados, green onion, lemon juice and zest. 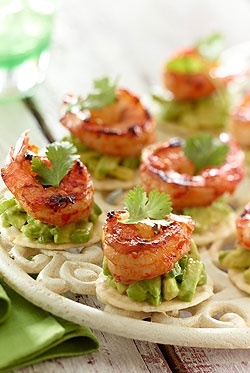 Top each cracker with 1 tsp (5mL) avocado spread and 1 prawn. Garnish with a cilantro leaf. A Favorite Website… I’ll add more websites at some stage as well..
Lightly coat both sides of the corn tortillas with cooking spray. Bake for 4 minutes on each side. Switch oven to broil. Evenly divide the cheese over the tortillas and broil until cheese is melted and bubbly, 2-ish minutes. Remove from heat and set aside. In a small bowl, combine the avocados, cilantro, lime juice and a pinch of kosher salt. Mash up with a fork until you get guacamole. Go ahead and eat a few bites for your well being. Toss the shrimp with the cumin, chili powder, crushed pepper flakes and garlic salt. Heat the oil in a medium skillet over medium high. Sear the shrimp on one side for 2 minutes; flip and sear 30 more seconds. Remove from pan. To the pan, add the sliced red bell pepper. Saute for 2 minutes, scraping the browned bits from the pan, seasoning the peppers. Sprinkle in a leetle salt. Spoon the guacamole over each cheesy tostada, followed by shrimp and red bell pepper. Garnish each tostado with cilantro and give another good squeeze of lime juice over each one.